Two employees were seriously burned while working in an automobile garage. The employees had begun to hand clean the vehicle after spraying it all over with a flammable cleaning solvent. According to the manufacturer's instructions, the proper use of the solvent was to pour it on a cloth and rub over the surface of the vehicle. 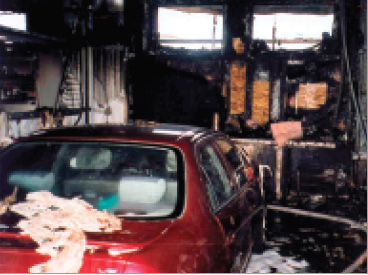 The combination of improper use of the flammable cleaning solvent and insufficient exhaust ventilation created an explosive atmosphere in the garage, which was ignited when an employee lit a cigarette. The resulting explosion and fire grew quickly because the flammable solvent and other chemicals were stored in the same garage bay. Never keep more than one day’s supply of chemicals in your immediate work area. Store and mix chemicals in a well-ventilated chemical storage room separate from the work area. All employees who use or work in the vicinity of controlled products must be trained by a competent person in Workplace Hazardous Materials Information Systems (WHMIS). Employers shall ensure that employees receive training and instruction on the specific controlled products used in the workplace. Follow manufacturer instructions located on product labels or technical bulletins. Review with staff and make available for future reference all Safety Data Sheets (SDSs) pertaining to controlled products used in the workplace. New products must be reviewed with staff before use. Enforce strict no-smoking policies in areas where flammable chemicals are used or stored. Keep ignition sources, including electricity, away from flammable chemicals. Mechanical ventilation is required to ensure employees are not exposed to chemical concentrations above the allowable Threshold Limit Values (TLV), and to prevent the build-up of flammable vapours. Fire extinguishers must be readily available, and a fire evacuation plan should be developed and posted. First aid supplies and a trained first aider must be on site.